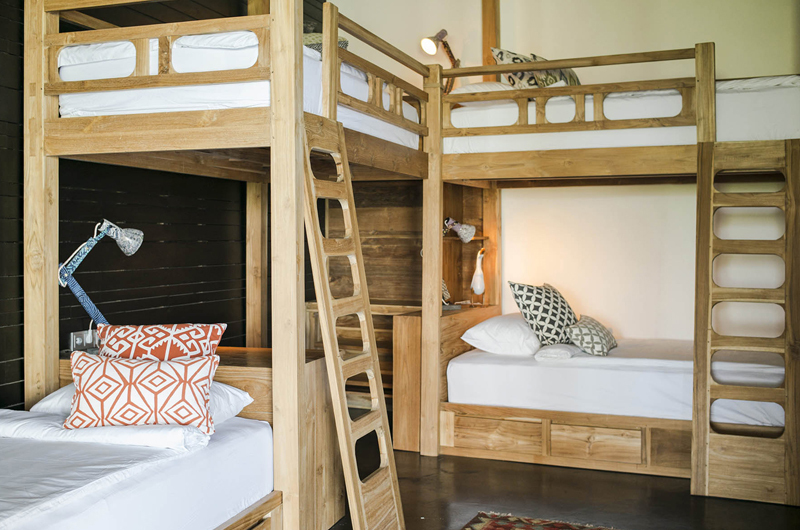 We have a slight obsession at the moment with the stylish bunk bedrooms in Bali. 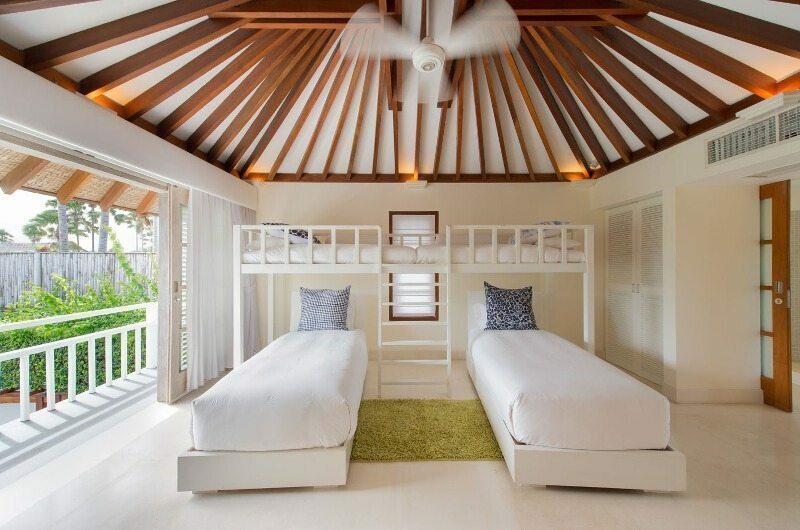 Purpose built to ensure the kids have a blast on the ultimate villa holiday slumber party. We always recommend this alternative when you are bringing multi-generational families together or travelling in large groups with children. 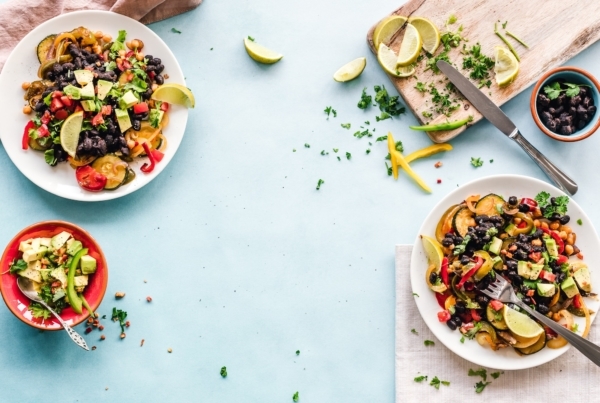 Keep scrolling to take a look at a handful of our favourites and see why we think they are the perfect choice for your next holiday in Bali. 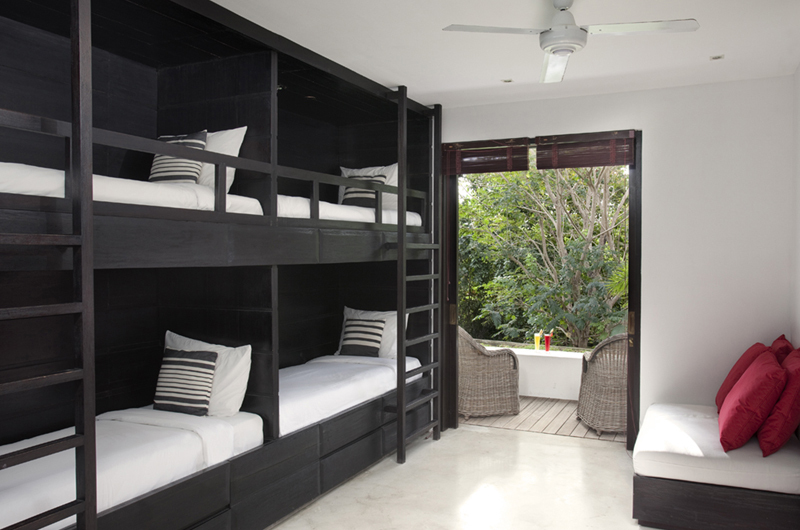 Sleekly furnished with 4 bunk beds and a private ensuite bathroom all within walking distance of Echo beach in Canggu. Complete with a spacious courtyard with comfortable seating for 10 guests that is great for family barbecues and outdoor entertaining. If that wasn’t enticing enough, the interactive media room also has flat screen TV’s, a PlayStation 2, a selection of DVDs, board games and books to choose from. A funky vibrant setting with large flat outdoor spaces, perfect for the children to kick a ball or run around. 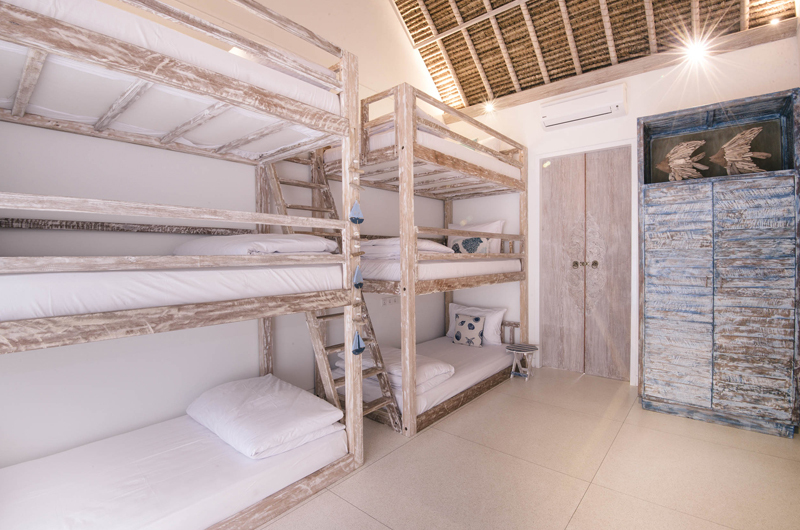 This stylish Canggu retreat has multiple bedding configurations available as well as a bunk bedroom located directly across the hall from the master. Close for comfort for parents when the children are only a stones throw away in the independence of their own space complete with an ensuite bathroom. A family’s dream luxury villa with 7 sprawling bedrooms, a 25-metre lap pool and lush outdoor spaces. Well thought out in design with a wading pool for the kids to splash and play as well as a tropical garden generous in size offering plenty of room for the whole family. 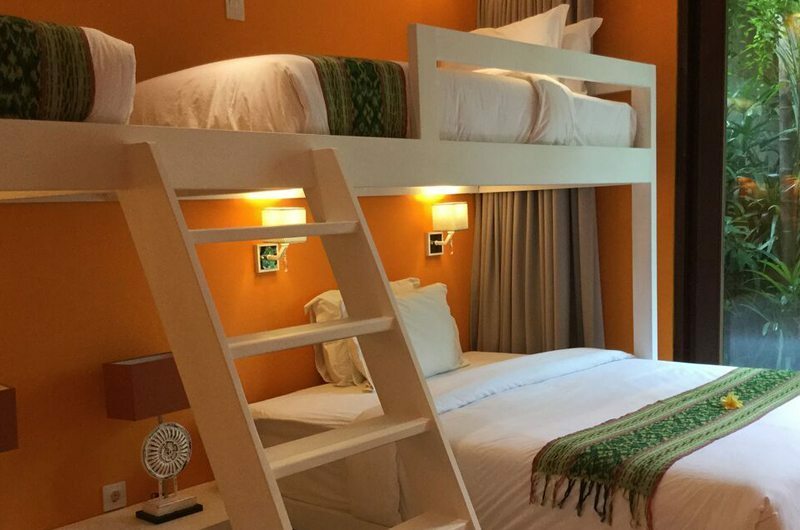 The bunk bedroom is located on the lower level and can fit up to four children– meaning the kids won’t be rushing up and down any stairs. The ideal location just minutes from Finns Recreational Club (Splash Waterpark) and delicious restaurants. We love the sublime comfort of the open aired living areas and adjoining timber decking that surrounds the bright blue swimming pool. Featuring a gradual stair access into the pool and mostly flat outdoor spaces, it is great for the kids with minimal trip hazards. The dark timber bunk bedroom sleeps 4 and has a connecting ensuite bathroom. Ideal for large multi-family villa holidays as this retreat is quite literally a sanctuary away from the crowds. A sprawling 35-metre pool features a shallow end for the kids and multiple parasols poolside offering shade. The ultimate pavilion style getaway with 10-bedrooms all with ensuite bathrooms – 2 of which are bunk bedrooms sleeping 10 children. Overlooking pristine rice paddies in hip Canggu, is a striking designer villa with open-planned living and dining rooms. After taking a dip in the pools wading area, the children can take the small steps leading down to the huge lush lawn area. The contemporary style bunk bedroom sleeps 4 children and shares a bathroom with the sixth bedroom. Beautifully bohemian in style and located on the tropical island on Nusa Lembongan. A 3-bedroom villa offering the epitome of the laid-back holiday lifestyle that Bali has to offer. Suitable for children of all ages, the bunk bedroom sleeps 6 and features an outdoor open-air bathroom. We note this may not be for everyone, but recommend trying if you are staying in Nusa Lembongan and want barefoot luxury. Expansive 2 hectare estate providing a close-to-nature playground away from the hustle and bustle in relaxed Tabanan. Like most villas featuring bunk bedrooms, a shallow section for the kids is located at one end of the 18-metre swimming pool. When the kids aren’t splashing in the pool, you will find them in the air-conditioned games room around the pool table or playing board games. Prepared to be spoilt for choice when staying at this tropical paradise of rolling green hills with an endless list of things to do at Kaba Kaba Estate, Tabanan. The kids will have fun exploring the grounds which include a tennis court, library, games room, home theatre room and many (4) swimming pools. 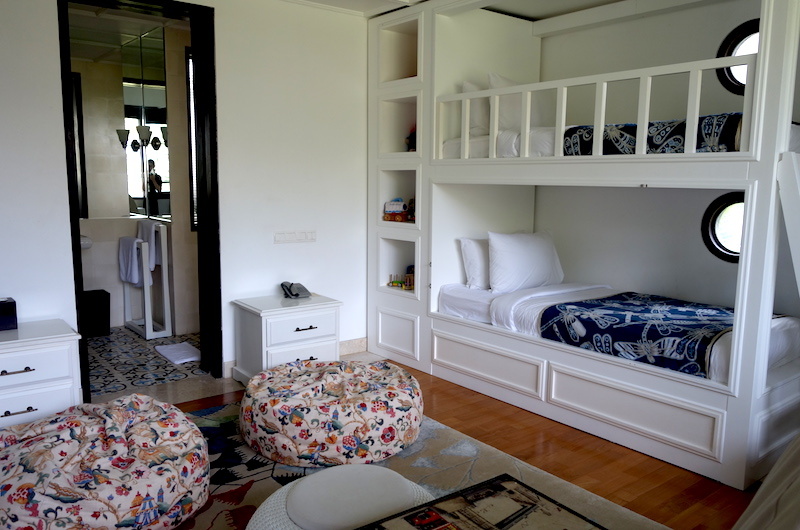 A chic white bunk bedroom awaits the children which sleep 4 guests with a connecting ensuite bathroom. A design inspired by Ralph Lauren’s Caribbean home, white washed in colour and starring rich wooden flooring is our nautical Seminyak villa. Versatile in layout, this stylish children’s bunk room can also feature a queen-sized or two single beds for extra bedding options. The villa staff here will become family by the end of your stay as they provide you with warm Balinese hospitality and impeccable service. 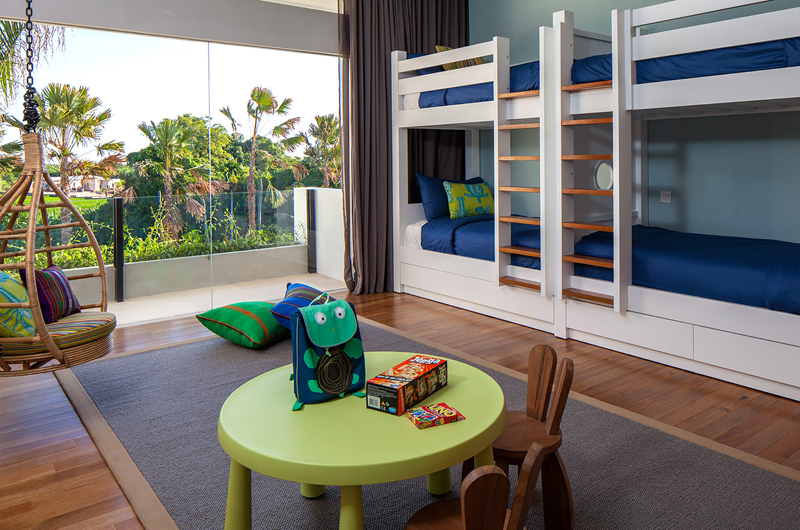 A stylish children’s bunk bedroom that is undoubtedly one of the most stunning in Bali in a highly sought-after location in trendy Seminyak. Beautiful décor and a tropical setting all within walking distance of great restaurants and Bintang Supermarket makes for an easily accessible family villa. 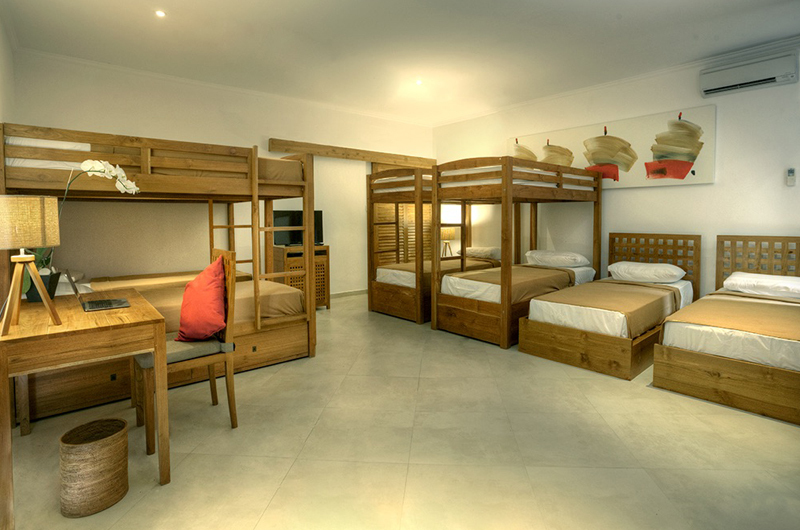 Connecting with the master bedroom and sharing an ensuite bathroom, Villa Hermosa’s bunk room is one of our favourites. Spectacular grandeur can be found at this 6-bedroom white villa – influenced by both Javanese and Singaporean style. The bold floor plans of huge rooms and high ceilings are a rare find in the heart of Seminyak. Safety is thought of first in the kids bunk bedroom with stair cases including railings for the top bunk made out of rich stained wood. The lower bed can be kept as a king or divided into two singles with an optional connecting door to a king-sized bedroom. 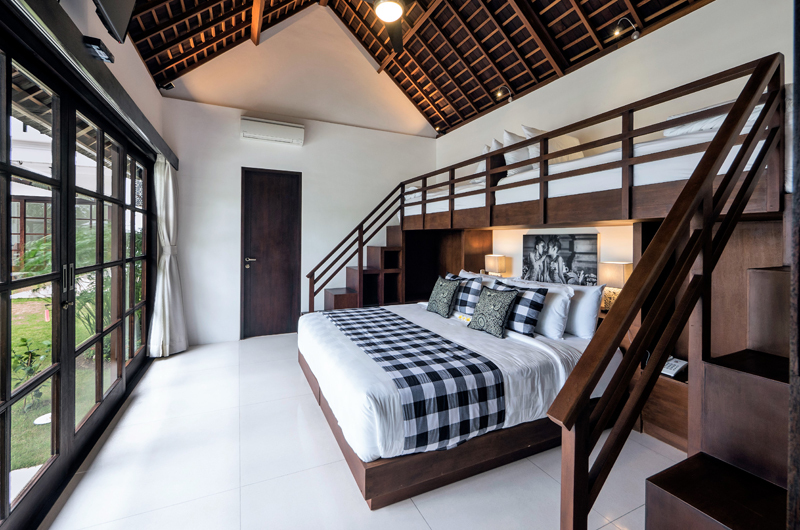 One of the most interactive living and media rooms in Seminyak with a pretty bunk bedroom nearby. The room includes funky bean bags, a flatscreen TV, DVD player, movie box and Nintendo Wii. Choose between a split bed set up or sprawling king bed with bunks above. Close by this family-friendly villa is well known Eat Street and Petitenget Beach all within walking distance. Just a short stroll around the corner from popular Eat Street in trendy Seminyak is this bright and versatile villa. 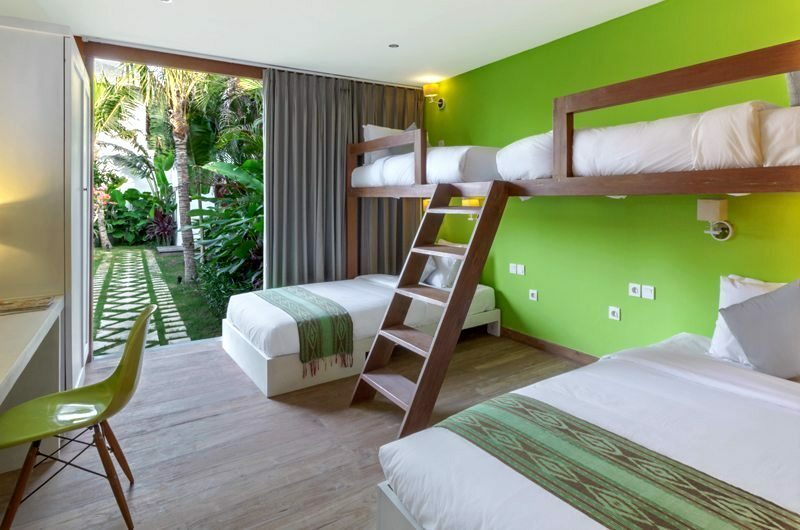 A lush garden for the kids to run around in and a colourful bunk room is a rare find in the famous Seminyak area. The swimming pool also features a shallow end for the younger kids and ample sun loungers for you to recline in. A kiddies haven with a cute bunk bedroom located close by the parents inter-connected master bedroom. 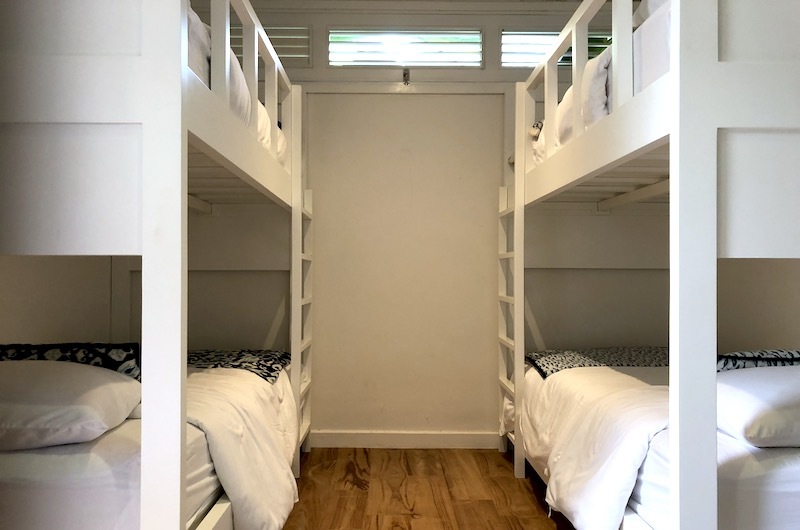 With a flexible configuration depending on the ages of the children you are travelling with; the lower beds are doubles with the top bunks being single beds. No need to stress on how to keep the children entertained, as there is an extensive DVD selection and library for the children to browse whilst they aren’t splashing in the aqua swimming pool. 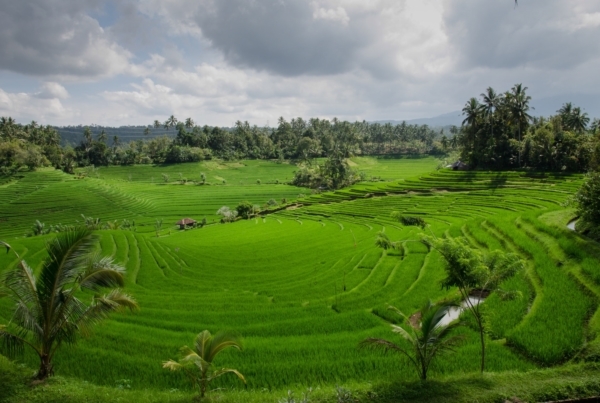 A serene setting of Kerobokan’s stunning rice fields all within a 5-minute drive of nearby Seminyak and a stones throw away from hipster Canggu. This sprawling Javanese designed villa has you experiencing new age luxuries such as 3 pools to choose from and an expansive lawn area for the children to run and play. 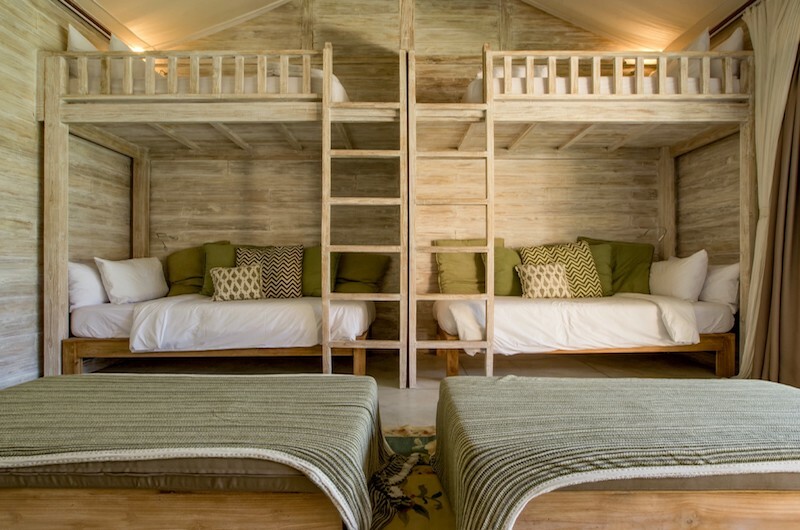 A double bunk room is complete with wooden furnishings and an ensuite bathroom. If you are looking for a child friendly Bali villa we can help you plan and book your next family holiday. 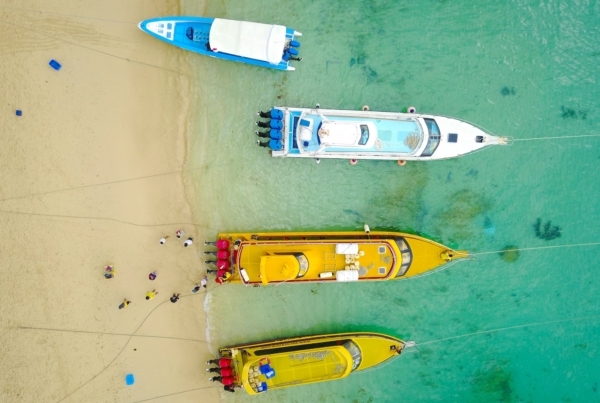 We don’t only ensure the villa suits your families needs, but can also have our concierge team hire child friendly equipment like a pool fence or pool toys to make your stay hassle free. For your free quote today from one of our skilled villa specialists contact us here.